ProcessTimer displays the architecture, CPU utilization and percentage of real memory used by the process that has GUI focus. Two small windows are used in order to display the CPU percentage and MEM percentage. Colored windows can be created as well! The windows are floating windows, by default they show on top of other windows. The window level of windows can be modified if needed. The update frequency is set to often (1 sec) but can be modified. ProcessTimer can send a specific signal to a process if wanted. Also, ProcessTimer can show/hide a GUI process or quit a process normally. 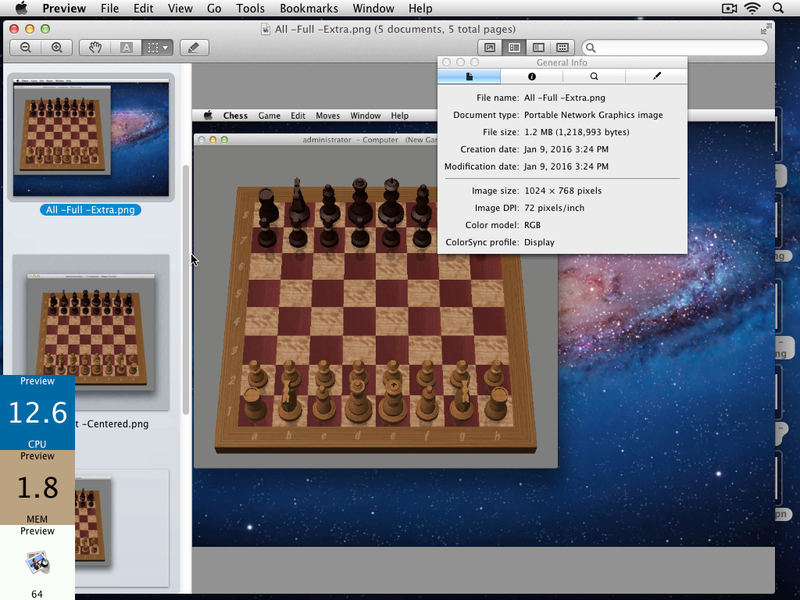 ProcessTimer follows the process that has GUI focus, the frontmost app, by default. This behavior can be changed by Hold Process, and ProcessTimer will follow the specific process for the remainder of the lifetime of the process, regardless if the frontmost app has changed. Hold Process can be switched on or off. 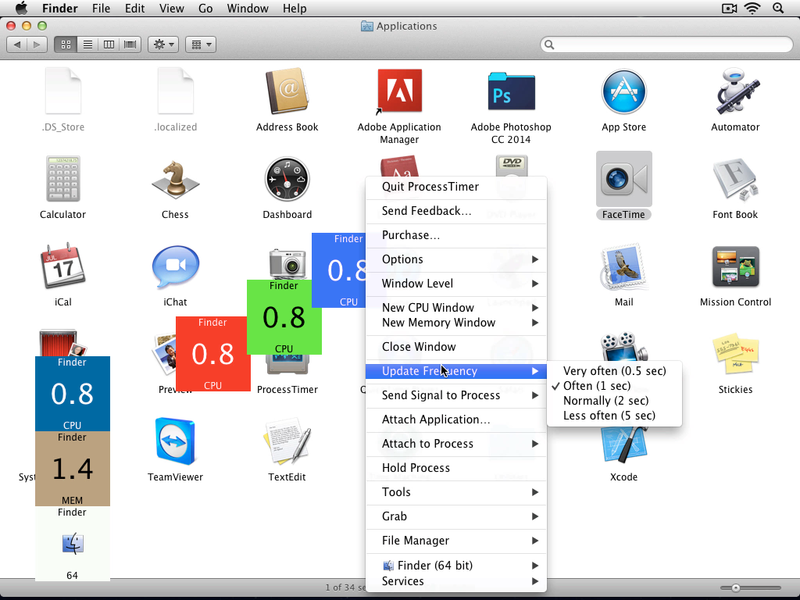 Attach Application is a neat feature that enables you to launch an app if not already open. Attach to Process is another neat feature that can be used to select any running process, regardless if it has a GUI. Aforementioned features automatically activate Hold Process, effectively "attaching" ProcessTimer to the process. ProcessTimer has several tools to its disposition. Open, can be used to show an app window (if any) if app is an agent. Open at login, is used to set the preference if the app is to be opened at login. Open Preferences File, finds and opens the preferences file (plist) of the app if present (Xcode or other app is required to open). Show Info, shows the Finder info panel for the app. Reveal, shows the app location in Finder. 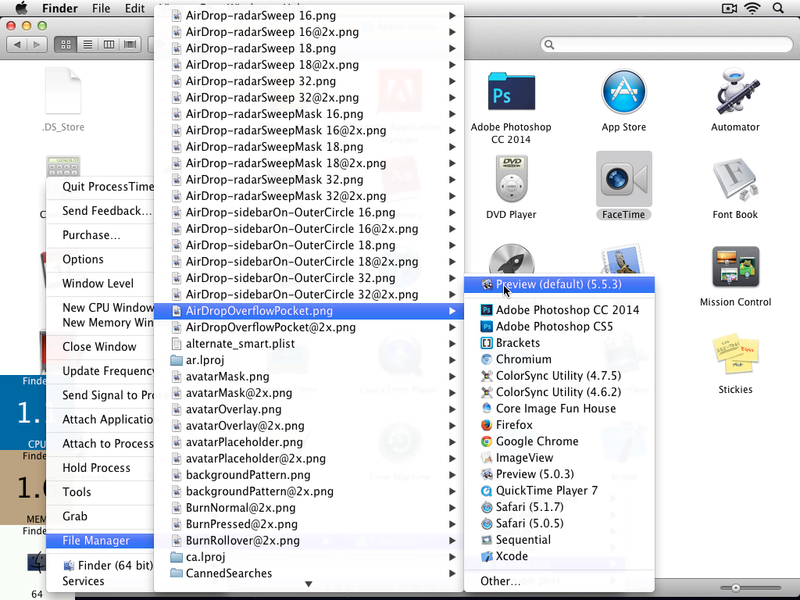 Last but not least, ProcessTimer employs a powerful file manager, a file explorer, to explore the contents or reveal a resource within an app bundle in Finder. 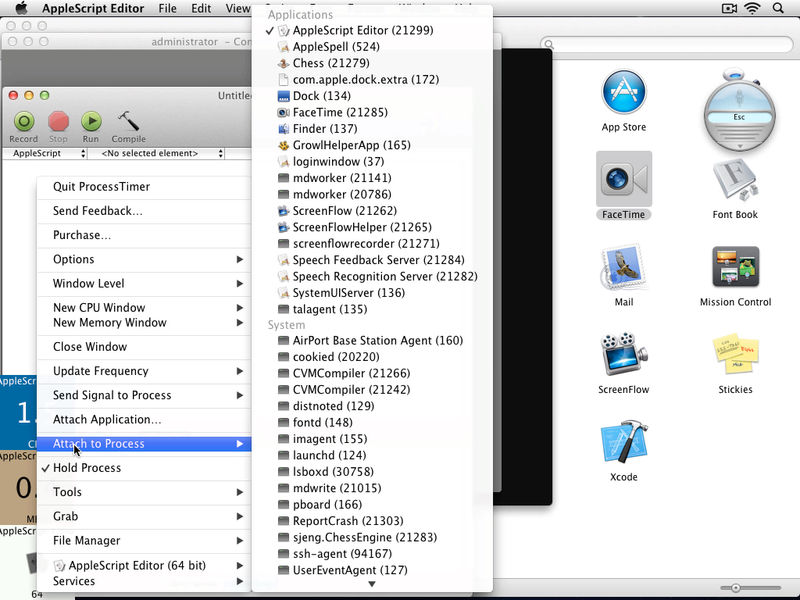 File Manager also includes Open With functionality to open selected resource within an app bundle with selected app. ProcessTimer also has powerful screenshot grabbing capabilities. It has five options in total. Frontmost -Centered is the most unique of the five, it grabs the frontmost window of the frontmost GUI process, centers the window in such a way that the resulting image has square proportion. If no texture image (256x256 only) is specified, the background is transparent. Frontmost grabs the frontmost window of the frontmost GUI process, the background is transparent. Frontmost -Full grabs the frontmost window of the frontmost GUI process, but the resolution is that of the screen (display) of the window, the background is transparent. All -Full grabs the frontmost window(s) of the frontmost GUI process, same as the aforementioned option, but grabs all windows belonging to the process. All -Full -Extra is the second most unique option, it does the same as All -Full but includes the Desktop background, the Menu bar, the Dock (if not hidden) and any Growl notifications.